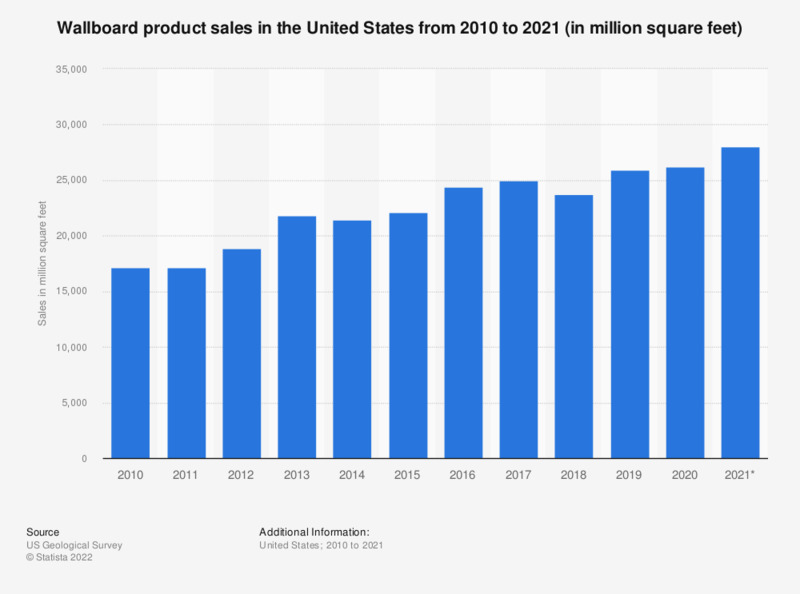 This statistic represents the wallboard product sales in the United States between 2007 and 2018. In 2018, approximately 25.5 billion square feet of wallboard products were sold in the United States. After its tremendous downturn following the 2008 subprime mortgage crisis, the housing industry in the United States is making a comeback, especially in markets like New York, Dallas and Houston. S&P/Case Shiller's national home price index for the United States is expected to grow to some 186 points in 2016, up from around 128 points in 2011, the worst year for US housing in half a decade. As a result, building material manufacturers are trying to tap into the market and have begun to raise prices dramatically. Thus, homebuilders are faced with increasing costs of building materials. Major companies involved in building materials include the United States Gypsum Corporation, Lafarge and Wacker. Wallboard, which is also known as drywall, plasterboard or gypsum board, is a panel made of gypsum plaster. The panel is usually sandwiched between two thick sheets of paper to make interior wall and ceilings. Wallboard construction is prevalent in North America in comparison to the traditional usage of lath and plaster due to quicker application. Some 37.1 million metric tons of gypsum was consumed in the U.S. in 2016. The rise in prices is believed to be driven by increased building activity and demand from home improvement retailers. In the long run, expensive construction materials are set to have an impact on property prices, too. At 313,600 US dollars, the U.S. median house price of new homes sold in the US has increased steadily over the last decades. * The standard unit used in the U.S. wallboard industry is square feet. Multiply square feet by 9.29 x 10 to the -2 to convert to square meters. Figure for 2016 has been restated in the 2019 edition of the report. Figures for 2007 to 2013 are taken from a previous edition of the publication. The figure for 2018 is an estimate.